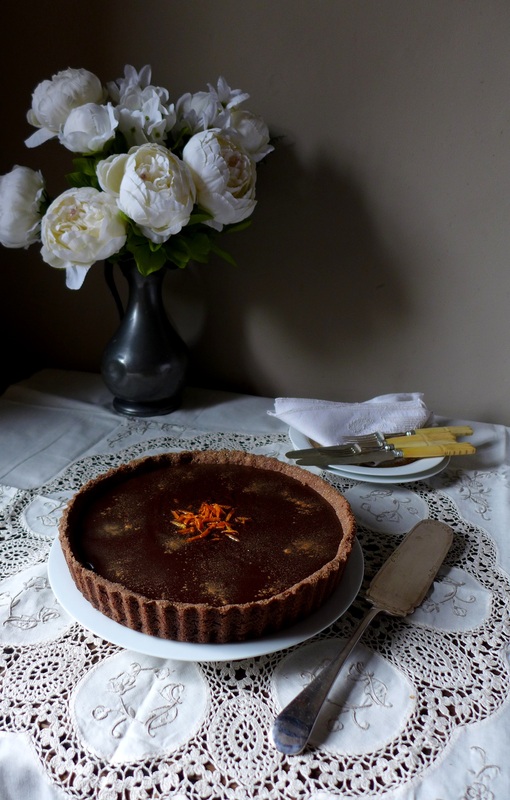 Possibly the perfect end to that special Valentine’s Day dinner, this easy-to-make tart combines a double hit of chocolate with the tang of orange marmalade. The crunchy biscuit base I think works much better than pastry, here. It’s also a heck of a lot quicker and easier. You can get ahead by making it the day before and chilling it in the fridge. When you make the ganache filling, though, please bear in mind it needs to set for at least two hours. Once completed, it is best eaten within 24 hours, although it will keep for two or three days in the fridge. It has quite a glossy top if you don’t get over-elaborate like I did (or can sprinkle golden fairy dust more evenly). Whizz the broken-up digestives with the cocoa powder in a blender. Melt 125g butter and add it, with the sugar, to the biscuit crumbs. 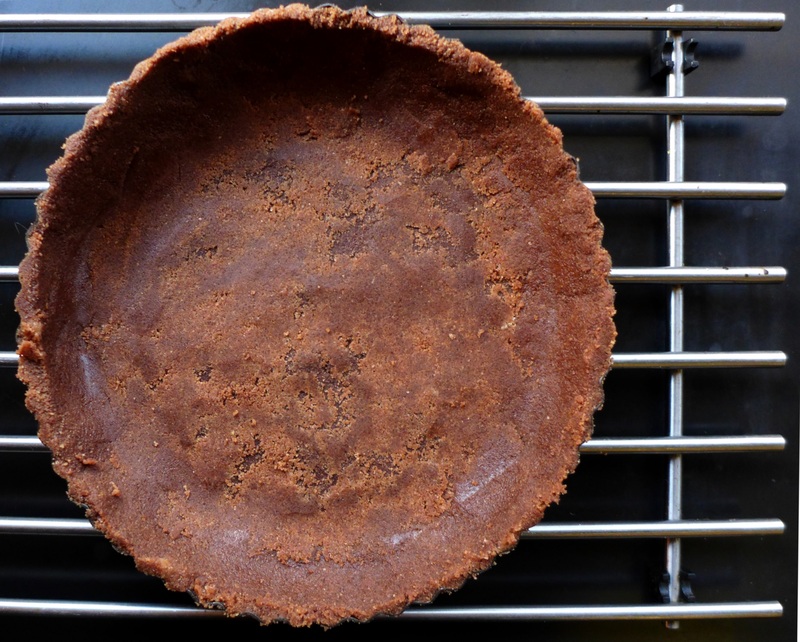 Press into a 23cm fluted flan tin with a removable base, pushing it up the sides and smoothing flat with a metal spoon. Bake for 10 minutes and cool on a rack, still in its tin. Once cool, spread the marmalade over the base. Break up the chocolate and place in a bowl with the butter, cut into small pieces. Put the cream, sugar and a pinch of fine sea salt in a saucepan and bring to the boil, then remove immediately from the heat. Pour it over the chocolate and butter and stir until everything is melted together and glossy. Allow it to cool for a few minutes, then pour it into the tart case. Garnish with orange zest and, if using, the edible gold dust. Leave at room temperature to set for 15-20 minutes before refrigerating. Remove from the fridge 15 minutes before serving, with creme fraiche or ice cream. 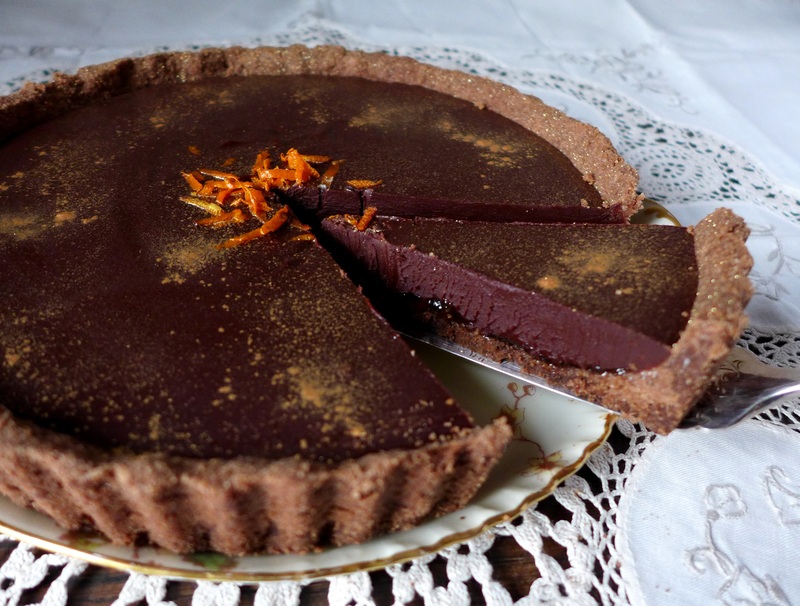 This entry was posted in Desserts, cakes and biscuits and tagged chocolate and orange tart, easy chocolate tart, Valentine's Day desserts, Valentine's recipes by Linda Duffin. Bookmark the permalink. This sounds good. And yes, I’m normally a chocolate tart refuser. My big problem with this type of stuff is an inability to stop myself from having “just another small sliver”. I then wonder where the tart has gone. Lovely job. Can l substitute graham crackers for digestive biscuits. Graham crackers l can make. Digestive biscuits cannot be found in rural Guatemala where l am a volunteer high school teacher. Hi Angharad, yes, you can substitute Graham crackers. It’s even easier if you can source the chocolate-flavoured (not chocolate-coated) ones! Then you can skip the part where you add the cocoa powder to the biscuit/cookie crumbs. All the best, Linda.